EL-41S-4K22 är en av CYP///s nyare HDMI switchar som presenterades på IEC mässan i Februari 2016. Denna switchen har även en "auto-switching" funktion som känner av och väljer den senast aktiva ingången. 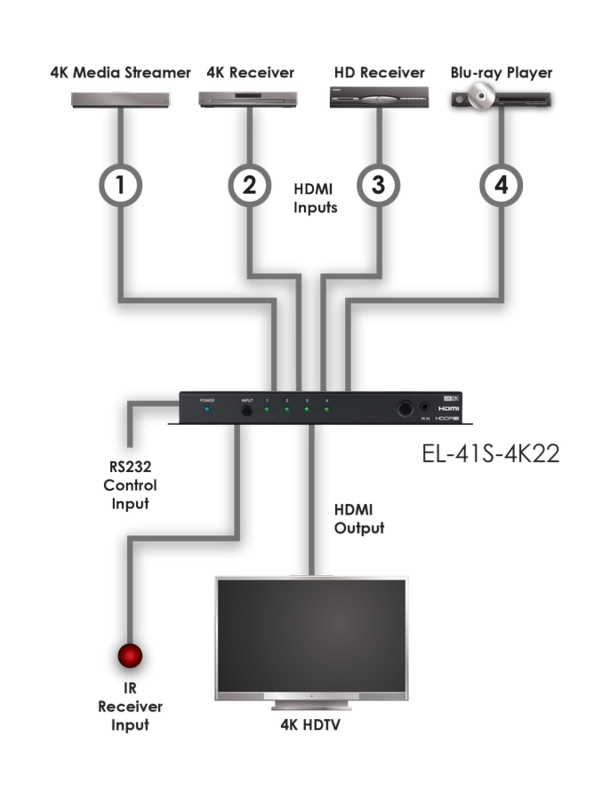 This 4-Way HDMI Switcher is designed to enable the user to switch between any of the four connected HDMI sources to send video and audio to a single HDMI display. This switcher fully supports 4K resolutions and is HDMI2.0 and HDCP 2.2 compliant, ensuring maximum compatibility with the latest 4K UHD sources and displays. The EL-41S-4K22 supports all the latest features of the HDMI 2.0 specification such as 4K UHD resolutions ([email protected] - YUV4:4:4),HDR (High Dynamic Range), 'Deep Color', and High Definition audio. In addition, this switcher also features an Auto-Switching function which detects the last active input and switches to this input automatically for display. Control is via IR remote control and RS-232.